Special music CDs, contain over 17 hours of fantastic music, let you start listening on the day this unit arrives at your home. DisklavierRadio; you can listen to over 11 music channel by streaming broadcasts over the Internet. Total 128 megabytes of internal memory comes with the Disklavier control unit to preserve your valuable data. 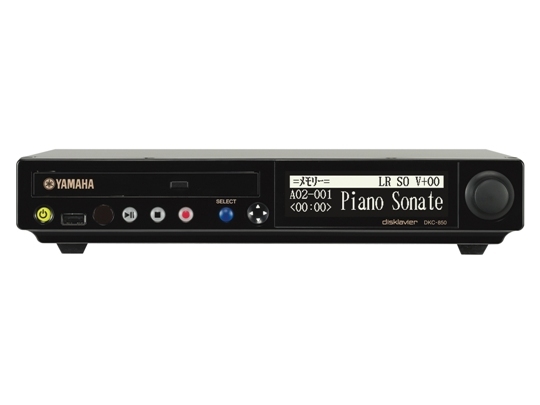 Connecting external USB devices to the Disklavier control unit allows you to record your performance directly onto them, or even make backups of your valuable data in the internal memory. Video synchronization features offer great listening experience with sights. You can see as well as hear performances with perfectly synchronized audio and video. Your valuable music data on the floppy disk can be played back with the optional floppy disk drive (UDFD01). The remote control, with clear and logical layout of buttons, lets you quickly enjoy the features of the Disklavier control unit. The display on the front panel employs an organic electro-luminescent display which makes it brighter and more easily readable than ever. Let goed op welke software voor uw model Disklavier gebruikt kan worden!